And it's another price drop as Bernard Gallay at Bernard Gallay Yacht Brokerage sends in news of a €470,000 cut on the 21m motor yacht Mathigo. 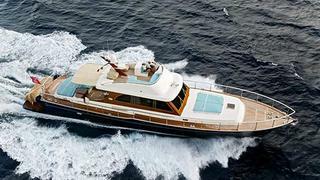 Built by Morgan Yachts in 2007, she accommodates five guests in a master, single and twin cabins plus a Pullman berth. She is powered by twin Caterpillar engines giving her a cruising speed of 10 knots and top speed of 32 knots. Mathigo is now down from €1,450,000 to €980,000.